Brand new Christians! 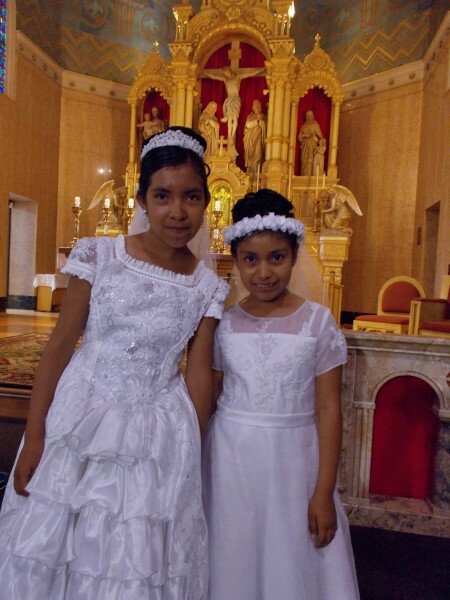 Dear girls Isabel and Leslie after their baptism at Holy Redeemer Church in June. I was their godmother (madrina, en espanol). 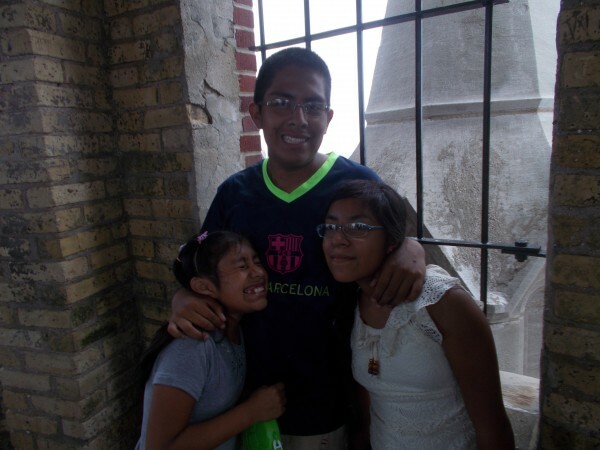 I promised them that they and I and their older brother Jose could go on the Cathedral Parish’s Spanish language bus pilgrimage to the Basilica of the National Shrine of Mary Help of Christians (Holy Hill) later in the summer. We’ve arrived! 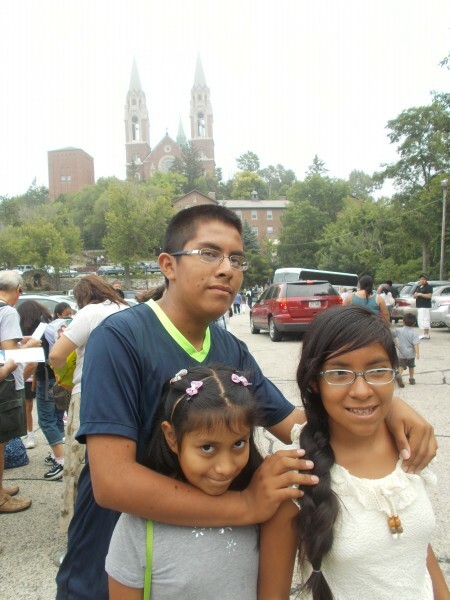 Jose, Leslie and Isabel with the amazing basilica church in the background. 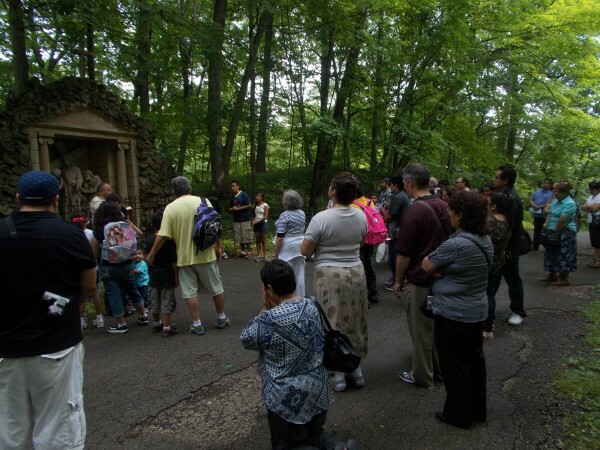 The whole group went first to pray the Stations of the Cross. 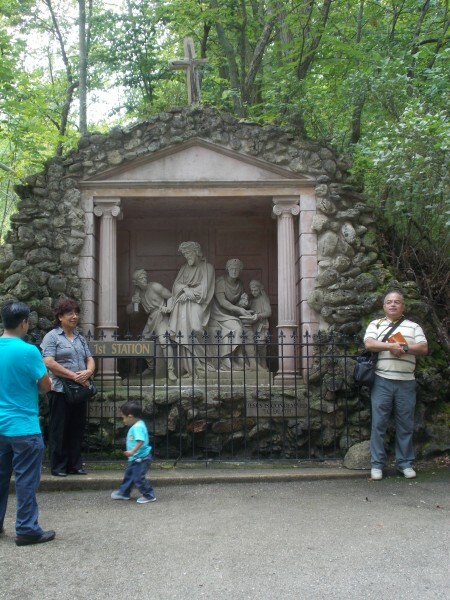 The sculptures for the 14 stations showing the suffering and death of Jesus for our salvation are carved from limestone and placed on a path that winds up the hill. Here Padre Jose Luis (on the right) is about to begin leading the prayers at the first station. 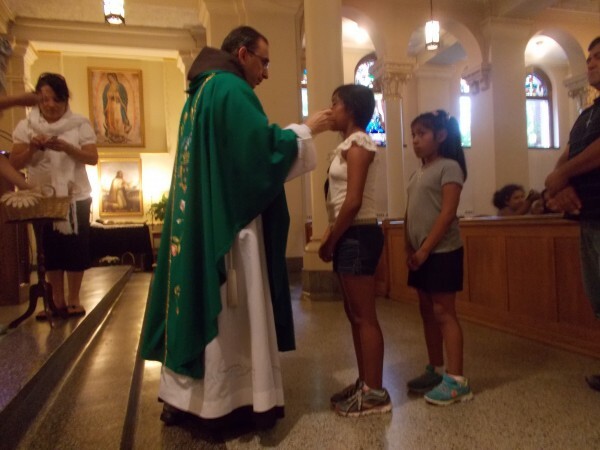 “Porque por tu Santa Cruz redimiste al mundo y a mi pecador.” After Padre Jose Luis read the prayers for each station we prayed a Padre Nuestro, Ave Maria, and Gloria al Padre. 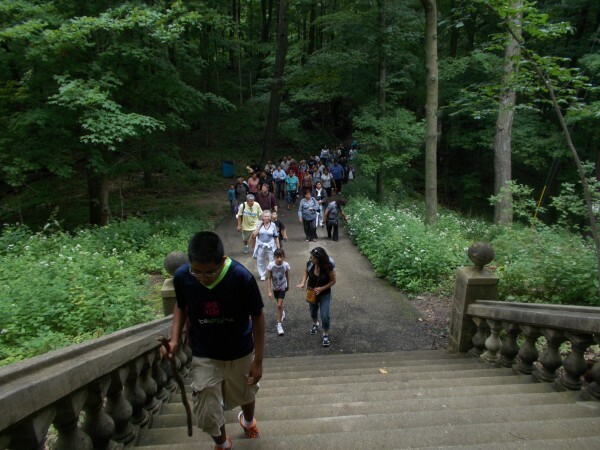 The path climbs more steeply as Jesus’ Passion progresses, with many stairs. The 12th station. Jesus dies on the cross. Jesus, my Lord and my God, You have given up your life for me, a sinner. It is right and just that I should spend the rest of my life for You. So remember the tall towers on either side of the church in the picture of it? Here we’ve climbed the 178 steps into the tower! It’s not easy. But the view far out over the countryside and the sense of accomplishment is worth it! You can see a long way! How very beautiful! The effort of virtue we make in the Christian life is important, but we’re only little children and the holy perfection of the saints is a much higher climb than this tower. We try our very best, but it’s the grace of God our loving Father that reaches out especially to the weakest of us if we call out to Him with trust and will lift us up to holiness even in this life like little children, and to heaven some day if we die in His friendship, trusting in Him. That’s the teaching of Santa Teresita, Saint Therese of the Child Jesus (of Lisieux)–her “Little Way” in nutshell. I actually took this picture on a different visit, but this is a view of the gorgeous interior of the main church. 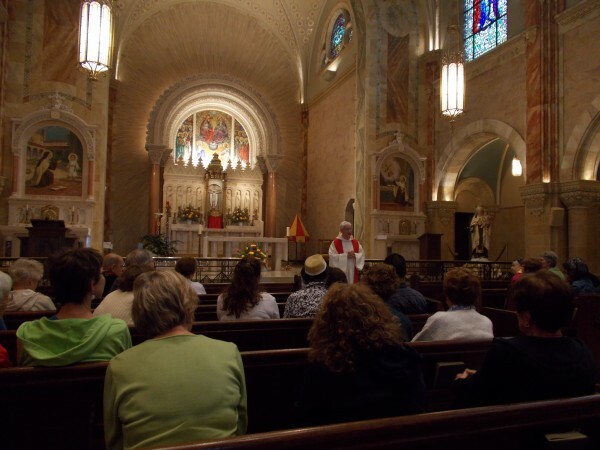 When we visited on Saturday we saw hundreds of people adoring the Real Presence of Jesus in the Eucharist during a very glorious time of Eucharistic Adoration! 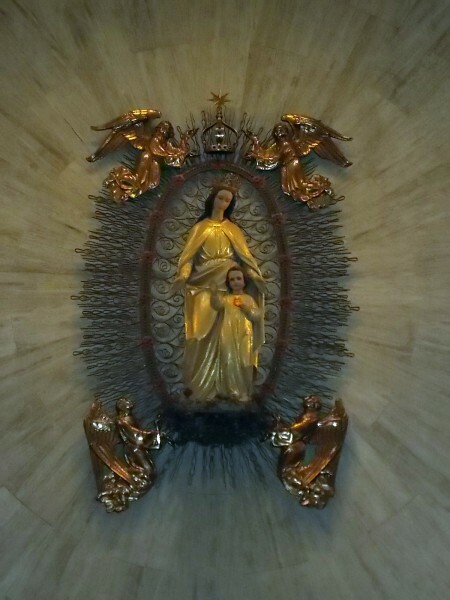 The image of Mary and Jesus in the Shrine Chapel, where many people have come to pray for healing and had their prayers answered. 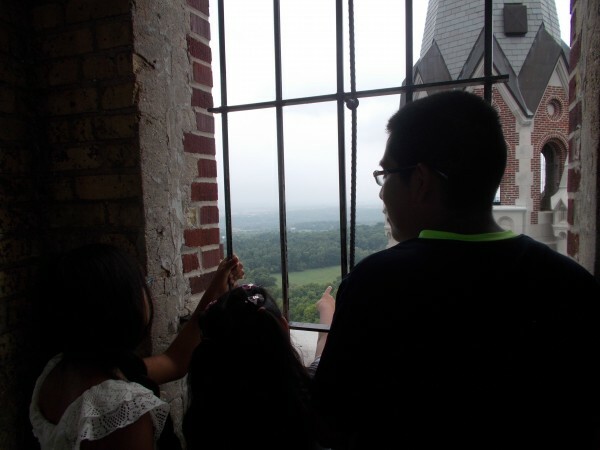 I’ve been to Holy Hill many times, but we got to see something new. 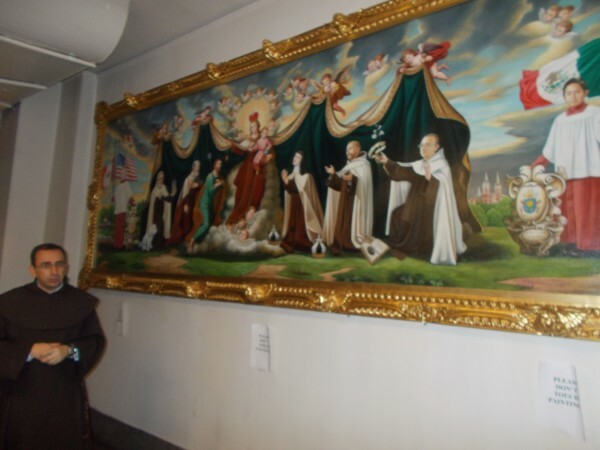 Padre Celedonio showed us two large and gorgeous paintings in the sacristy of the downstairs chapel of Saint Therese of Lisieux, which he had commissioned from excellent artists in Peru. His explanation was in Spanish so I don’t know all the details. 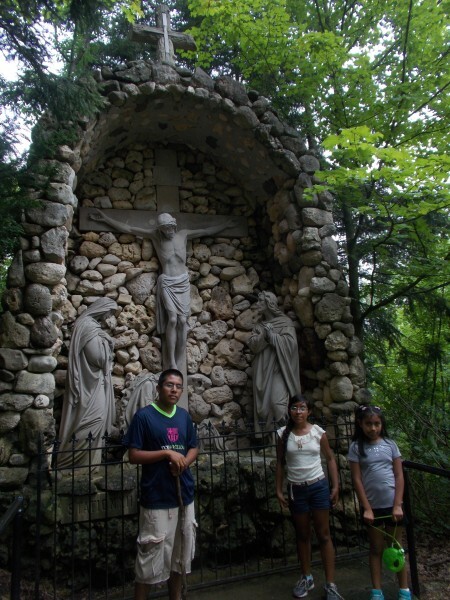 Prominent in this picture are Elijah on the left with the flaming sword, and Saint Teresa on the right! The Discalced Carmelites were founded in Spain in the 1500s by Santa Teresa de Jesus (de Avila) and San Juan de la Cruz. These Saints are the Church’s greatest teachers of prayer and the profound and tranforming experience of God’s love. Union with God in love, union con Dios en el amor is the purpose and goal of life. Santa Teresita (de Lisieux) whom I just mentioned was another Discalced Carmelite, in France in the late 19th century. These three are all Doctors of the Church. Here is the other painting, just incredible. 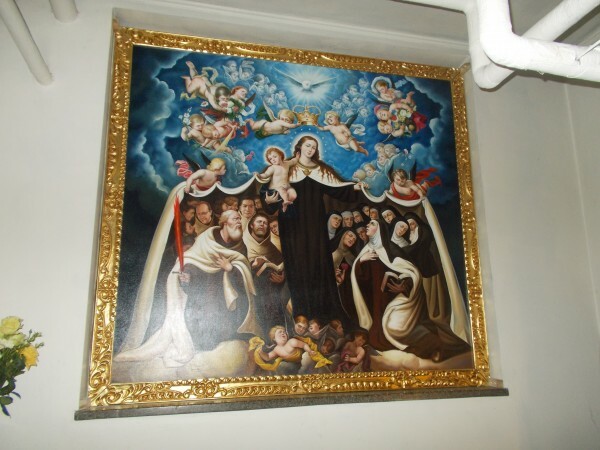 Both paintings show Our Lady’s mantle spread over Saint Teresa, Saint John of the Cross and other Carmelites. She is their patroness. This painting is very recent, that’s Pope Francis’ crest to the left of the altar boy. And the artist included some Holy Hill Carmelites–the friar furthest to the right is Padre Celedonio himself, and over on the left is Father Jude the prior of the community! This delighted me. Sorry for the fuzzy picture. After we prayed the Rosary and attended Mass, everyone in the group who wanted to was clothed with the Brown Scapular (Scapular Marron), which is the small version of the brown habit of the Carmelites, worn by lay people to associate themselves spiritually with the Carmelite Order and with Mary’s special protection and care for Carmelites. It also represents putting on Christ at baptism. When we become members of Christ’s body, we become children of Mary just as we become children of God. 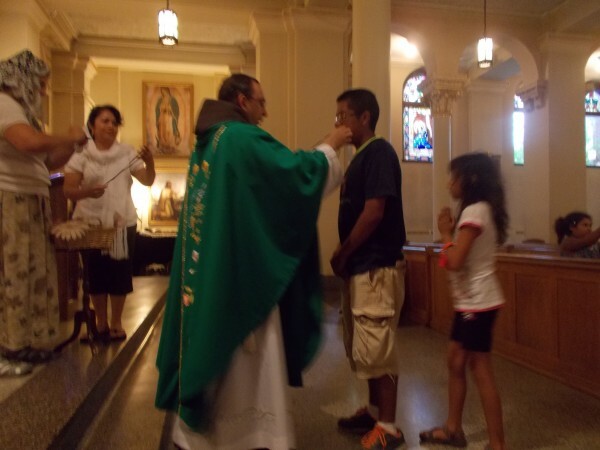 Here Padre Celedonio lets Jose kiss the scapular before placing it around his neck. Isabel kisses the scapular before it is put on her neck. The Brown Scapular is worn all the time and should be thought of as a little garment (not a necklace and certainly not a “good luck charm”), under the clothing. Those clothed in the Brown Scapular should live a moral life of purity, and practice Carmelite spirituality, especially devotion to the Eucharist and to contemplative prayer, and should always be devoted to Mary the mother of God who is also our own mother. 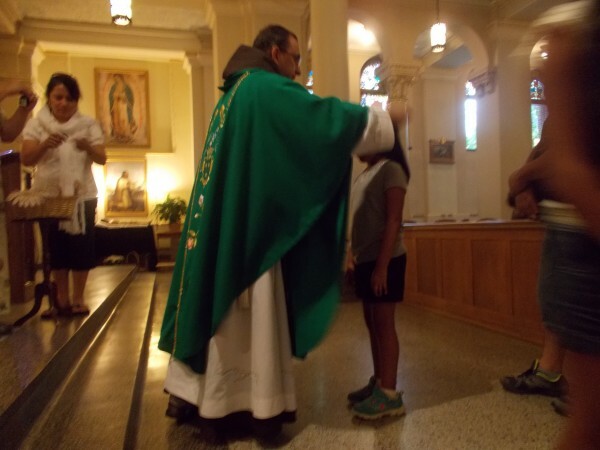 Leslie receives her Scapular too, una hija de la Virgen del Carmen! 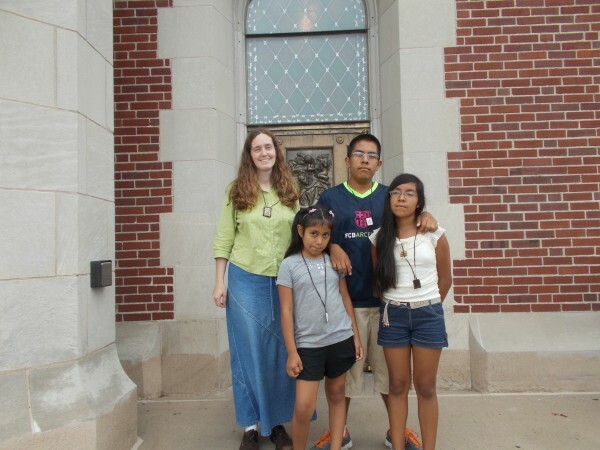 Here are the kids and myself, with our scapulars in front of the Saint John of the Cross bronze doors of the upper Basilica Church. I was clothed with the scapular by the Carmelites some years ago and wear it always with strong devotion to Carmelite spirituality and the love of Our Lady. We had a great day of spiritual learning and growing and climbing! 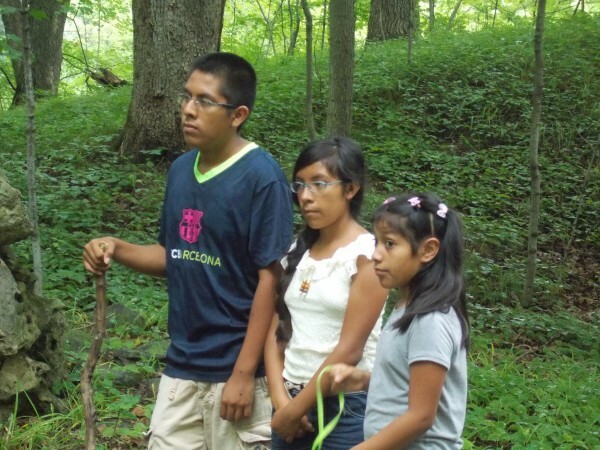 Maria del Carmen, Mamacita, continue to help us to be like Jesus!